Owl Cluster Ornament, by Raz. 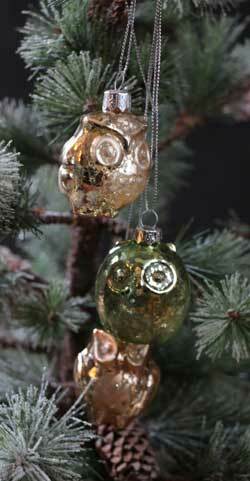 Cluster of three owls made of mercury-like antiqued glass - one each in copper, gold, and pale green, tied together with cord. Pearl Branch, by Raz Imports. 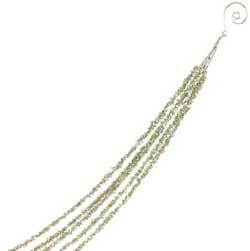 This branch is covered in superfine tiffany/champagne colored glitter and dotted with pearls - add instant pizzaz to your Christmas tree, or add to a floral arrangment! Measures 31 inches long. Part of the Champagne Frost Collection. Made of plastic. This red and white tree appears to be made of twisted peppermint candies, topped with lollipops, and covered in white glitter! This is for the Large tree. Pheasant Green, Teal, & Gold Striped Ornament, by Raz. 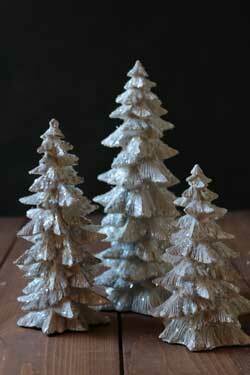 Made of glass, ribbed, with an antiqued finish, accented with glitter. 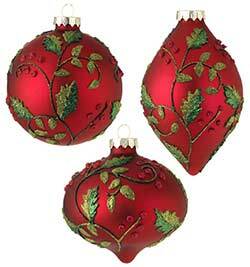 Sold individually - Choose the Drop (left), Onion (bottom middle), or Ball (right) Ornament. Part of the Pheasant Collection. Measures approx 4 inches. 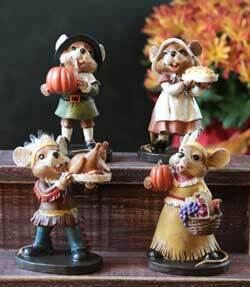 Pilgrim / Indian Mouse, by Raz Imports. Sold individually - Choose (top left to right) the girl pilgrim, boy pilgrim, (bottom left to right) boy indian, or girl indian. Measures approx 5 x 3.5 inches. Made of resin. Pink & Silver Antiqued Paisley Ornament, by Raz Imports. Drop-shaped glass ornament in a warm silver color with mercury finish, accented with paisley designs in pink and silver glitter. Measures 5 x 3 inches. Part of the C'est Noel Collection. 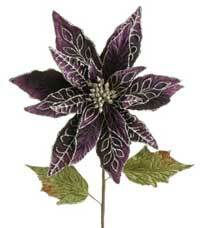 Purple Poinsettia Pick, by Raz Imports. 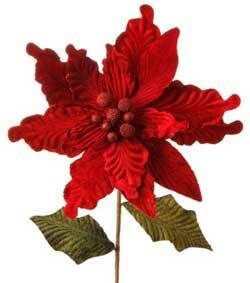 Beautiful fabric poinsettia with velveteen petals accented with glitter. 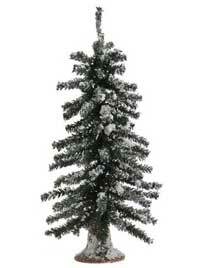 Measures 12 inches wide with a 26 inch stem. 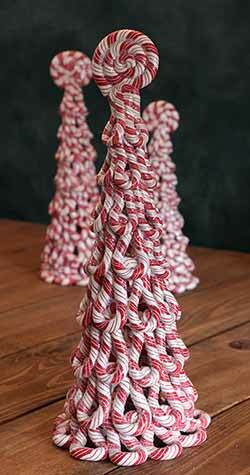 Poke into your tree, or use in a floral arrangement. Part of the C'est Noel Collection. Red & Green Swirl Christmas Ornament, by Raz Imports. 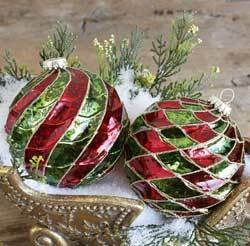 Red and green glass ball ornament with swirled indentations and gold accents. So pretty on a lit tree! 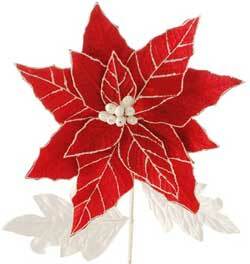 Red & White Poinsettia Pick, by Raz Imports. Beautiful poinsettia pick for tucking in your tree or floral arrangements, or a vase. 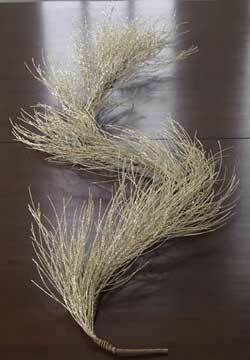 Measures 11 inches in diameter with a 22 inch stem. Part of the Joyful Silhouette Collection. 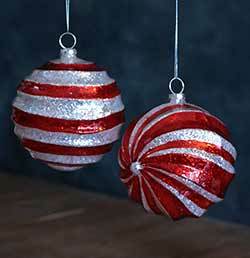 Glass ball ornament with molded swirled shape, coated inside with glitter for maximum shine with no mess! Red Holly Ornament, by Raz Imports. Beautiful ruby red matte glass accented with gold and green holly leaf and vine designs. 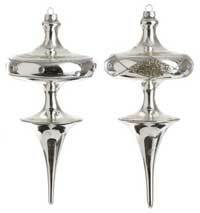 Sold individually - Choose the Ball (Left), Drop (Right), or Kismet (Middle) shape. Part of the Bird Collection. Measures 6, 4, and 3 inches inches. Made of glass with metal caps. Red Poinsettia Pick, by Raz Imports. Beautiful cranberry red poinsettia pick for tucking in your tree or floral arrangements, or a vase. Measures 12 inches in diameter with a 21 inch stem. Part of the Home for Christmas Collection. Silver Glittered Ornament, by Raz Imports. 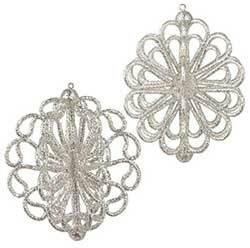 Beautiful, super-sparkly, round lacey ornaments covered in silver/white glitter. Part of the Iced Trellis Collection. Sold individually from two slightly assorted designs (we'll choose for you, and mix up if you get more than one!). Measures 5 inches in diameter. Made of acrylic. Also available in Red and Gold! 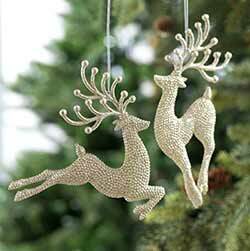 SilGlittery silver leaping reindeer ornament, in two assorted poses. 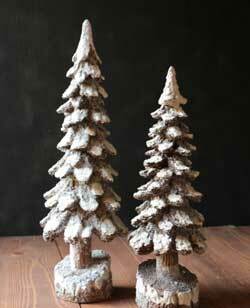 Sold individually - Choose the Left or the Right ornament. Measures 7 x 3 and 5.5 x 5.5 inches. Swan Ornament, by Raz Imports. 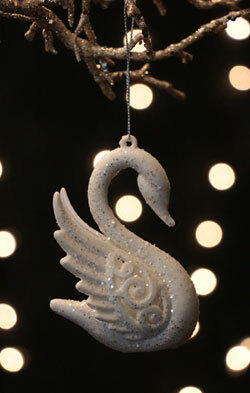 White swan ornament covered in superfine glitter. Measures approx 4 inches long. Made of acrylic. Tree Ornament, by Raz Imports. Very elegant! 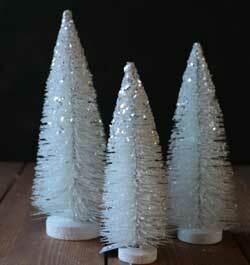 Lacy tree covered in superfine white/silver glitter. Part of the Winter's Lace Collection. Measures 6 inches. Made of plastic. Victorian Mouse Christmas Ornament, by Raz. 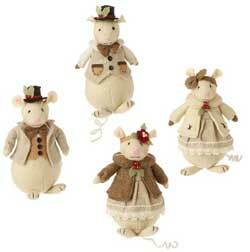 Darling felt mouse ornament in Victorian Christmas garb! 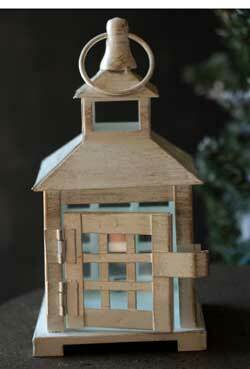 Welcome Home House Ornament, by Raz Imports. 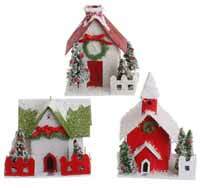 Green, white, and red vintage-style paper house ornament, accented with tiny bottlebrush trees, covered in glitter. Part of the Welcome Home Collection. 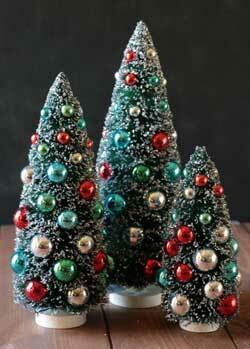 Sold individually - Choose the Left, Middle/Upper, or Right Ornament. Measures between 3 and 4 inches. Made of paper. 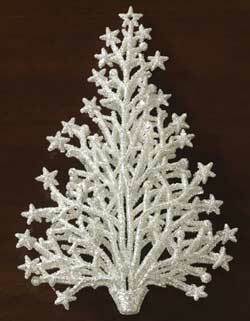 White Frosted Snowflake Ornament, by Raz. 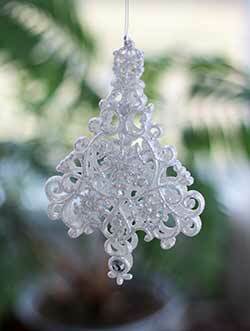 These lovely white frosted glass ornaments have a pretty, cracked-ice-like finish that shines beautifully on Christmas trees! Accented with snowflake images and tiny gems. 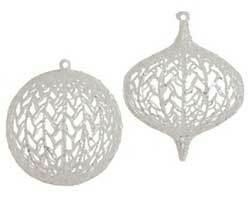 Sold individually - choose from the Ball (left) or Teardrop (right) ornament. 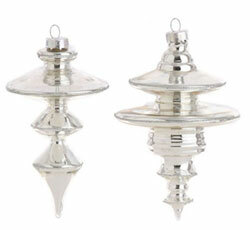 Has silver cap top for hanging. Measures 4.5 x 4 inches (respectively). 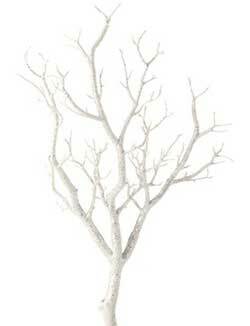 White Glittered Branch, by Raz Imports. 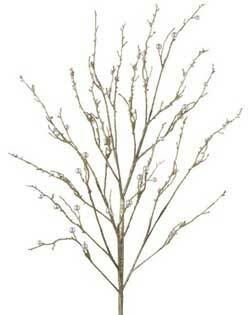 This branch is covered in superfine white colored glitter - add instant pizzaz to your Christmas tree, or add to a floral arrangment! Measures 25 inches long. Part of the Arctic Palace Collection. Made of plastic. 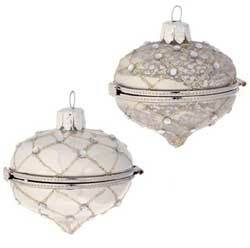 White Glittered Christmas Ornament, by Raz Imports. 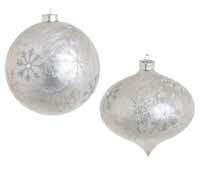 Super-glittery clear glitter ornament, sold individually from the two shown in photo - Choose the Ball (Left) or the Kismet (Right) ornament. Part of the Ice Garden Collection. Measures approx 5 inches. Made of plastic. 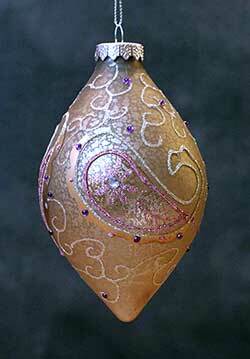 Beautiful tree ornament with scroll designs and clear gem accent, covered in superfine white/silver glitter. Part of the Ice Garden Collection. Measures 6.5 inches. Made of acrylic. White Lantern, by Raz. 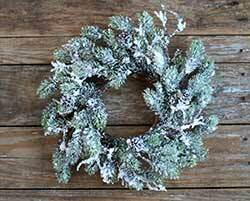 Use as a tree ornament or a shelf accent. Recommend use with a battery tealight. Measures 6.5 x 3.5 inches. Part of the Arctic Palace Collection. Made of metal and glass, antiqued and distressed for an aged look. 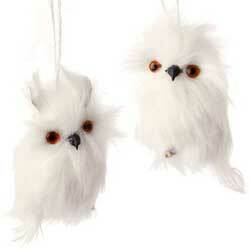 White Owl Ornament, by Raz. Beautiful furry owl figure, in a frosty white. Sold individually - Choose the Left or the Right Owl. Part of the Arctic Wilderness Collection. Measures4 inches. Made of polyfoam and faux fur. 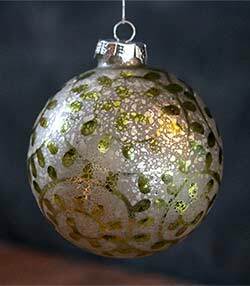 Antiqued, mercury-style glass ornament in a white/silver, with olive/lime green vine/leaf details. This is for the BALL Ornament. Measures approx 4 inches. White/Green Antiqued Ornament, by Raz Imports. 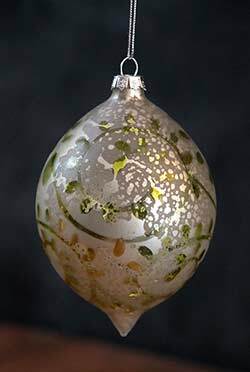 Antiqued, mercury-style glass ornament in a white/silver, with olive/lime green vine/leaf details. This is for the DROP Ornament. Measures approx 4.5 x 3 inches. Made of glass. Beautiful on a woodlands tree! Woodland Colors Glass Ball Ornament, by Raz. Made of glass, ribbed, with an antiqued finish. 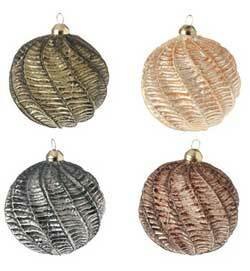 Sold individually - Choose the Ivory, Brown, Silvered/Blue, or Olive Green Ornament. Part of the Pheasant Collection. Measures 3.5 inches.